George Graham reviews Paul Simon's "This is Where I Live"
While emerging young performers are the lifeblood of the innovation process in music, it’s nice to see some veteran artists whose creative powers seem undiminished by the years. While there are plenty of old rockers who seem satisfied to play their oldies and talk about the good old days to their aging fans, it’s encouraging that there are artists who emerged decades ago who are not satisfied to tap the oldies for the rest of their career. On any such list, Paul Simon looms large, and he has just released his thirteenth solo album, in a more than 50-year recording career, called Stranger to Stranger, which may be his most interesting and creative in thirty years. To spare the need to ask one’s grandparents, Paul Simon met and began working with Art Garfunkel in about 1957, when they were both barely in their teens. Their first album as Simon and Garfunkel, Wednesday Morning, 3 A.M. came out in 1964, and Simon’s musical career and output as a songwriter has not ceased. After the split from Garfunkel in 1970, Simon began releasing his solo albums, most of which yielded significant hits and songs which have become standards in their own way. While most of a certain age tend to think of Paul Simon as a folksinger, often backed up by a group, for the past 30 years, Simon has become a kind of kind of sonic innovator and stylistic fusion artist. Two thousand and sixteen marks the 30th anniversary of Simon’s album Graceland, which blended in African influence, and was perhaps the most significant contributor to the popularity of World Music in the US. He continued the world music influence in following albums some of which were more successful artistically than others. His previous studio album So Beautiful or So What released in 2011, marked a change of direction from Simon, constructing songs around grooves and sonic elements, either from samples or distinctive instrument sounds. 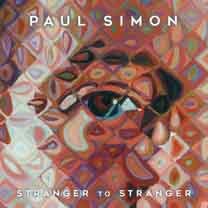 On Stranger to Stranger Simon goes headlong into the sonic experimentation mode, while still making appealing, instantly recognizable Paul Simon songs. Simon wrote some illuminating CD booklet notes about the songs on Stranger to Stranger and he talks about the combinations of instruments and sounds he used and seemed quite excited about than he says about his lyrics. He implies that most, if not all the songs, arose out of combinations of sounds he was experimenting with. He talks about recording flamenco musicians and dancers and sampling their sounds and slowing them down to an entirely different tempo. And most notably, Simon writes about the collection of unusual instruments that were created by iconoclastic composer and inventor Harry Partch, who in the early to mid 20th Century created instruments to play in a 43-note microtonal scale he invented, like the Cloud Chamber Bowls, Sonic Canons, and Chromelodeon. Simon himself plays a number of them on some of the tracks to provide the unique sonic textures that undergird this album. He also employs his cadre of top-flight musicians, many from a jazz background, including long-time percussionist Jamey Haddad. Lyrically, Simon comes up with a lot more than merely something to fill in the distinctive musical backdrop, with stories of a street kid, a song inspired by a visit to a healer in Brazil, and clever set of lines about a lost backstage pass as metaphor for the way the world treats us. As usual, Simon draws on a variety of interesting influences in his music, and it could be argued generates his own with his combinations of altered sound. And in the midst of it are two short instrumentals Simon originally wrote for a short-lived stage production. Paul Simon has been on the national recording scene for 52 years now. At age 74, he seems to be at a creative peak, as he explores interesting sonic combinations, putting a decidedly human face on the sampling technology which has turned so much of the commercial contemporary music scene into robotic, artificial sound. Thirty years after his groundbreaking Graceland album, he has exploited another creative paradigm that he began on his 2011 album So Beautiful Or So What, and brought it to a higher level. And, his vocals are also in top form. While this album revolves around its sonic textures, I’ll give it an A-minus for sound quality. Simon’s vocals are well recorded with good clarity, and the sonic mixtures are generally well-handled. Simon again works with his long-time engineer and co-producer Roy Halee. But as usual, we’ll deduct points for the inane practice of jacking up the volume by compressing the loud and soft parts to be all about the same. Paul Simon does not release albums very often, but when he does, they are usually significant musical events. Stranger to Stranger is no exception and I would rank it close to his Graceland album.